In the Green Kitchen is about the art of simple cooking. Alice in her wonderful way gathered together some of her favorite chefs, authors and homecooks who are passionate about green food, to teach basic techniques from poaching eggs to filleting fish. The idea behind it being that these recipes & techniques are the ones to learn by heart, so that everyone has access to the truest flavors of the best ingredients of the season. While I didn't have the money to purchase the cookbook at the time (though I plan on it once my funds are more fat with cash) I did some research on that wise old web. The Green Kitchen did a great video experiment that brings a lot of what the book teaches to life. These videos feature chefs like Thomas Keller (French Laundry) doing a roasted chicken to David Chang (Momofuku) doing a Tomato and Tofu Salad. Each chef performs simple recipes that make your mouth water while not being too complicated to copy. Alice says that to have a Green Kitchen and make these lovely recipes all that is needed is a sharp knife, a mortar and pestle, a cutting board, a frying pan, and a compost bucket; and fresh, local ingredients, sustainably grown and harvested -- in other words, food that's good, clean, and fair. I have attached both Mr. Keller and Mr.Chang's videos for a quick taste of The Green Kitchen Video project. To see the other 15 episodes and to check out the project click here. 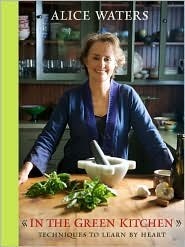 Also check out the cookbook here for a beautiful non 2.0 version of In the Green Kitchen. Happy Eating!